On Sunday of our whirlwind tour, we headed south from Jerusalem to visit Arad (pronounced AH-rahd). 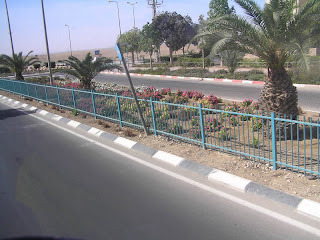 Bordering both the Negev and Judean Deserts, it is the first planned community in Israel. It happened to be the 50th anniversary of Arad, so we helped celebrate by planting a few trees. Not the purchase of tree certificates ... literally planting saplings. Those pipes are drip irrigation, saving us from having to return weekly to water the trees. We then traveled to Kfar Hanokdim, a Bedouin village deep in the Judean desert. After the 20 minute ride we dismounted and headed to the welcoming tent where a guide spoke about his Bedouin childhood and Bedouin nomadic traditions. We sat on padded mats and rugs underneath a tent made of black goat hair panels, shielded from the sun by a roof of what looked like palm fronds and other dried materials. Just about everyone who heard that theHubby and I were going to tour Israel told, not suggested but told us that we simply had to visit a particular bakery in the Mahane Yehuda Market in Jersusalem (aka the Shuk ... see yesterday's post for a few more details). "That bakery has THE best rugelach ever ever EVER!" they all said. Since food is my middle name (of course not, I'm just teasing ... it's really chocolate) I was really looking forward to heaven in a box. We walked up and down the shuk, trying to find this magical bakery. Didn't see it. 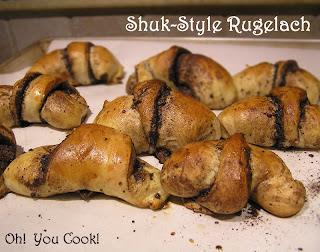 Saw many other bakery stalls with nothing that looked like rugelach, but not The One. We finally gave up and left the shuk to hit a felafel joint across the street for lunch, then boarded the tour bus. Of course, while we were on the tour bus heading back to the hotel we drove by the bakery. It was outside the shuk, about a half-block away.